I love this time of year. Even though the trees have lost their colorful leaves and there is no snow on the ground (yet) to cover the many shades of brown, I find myself feeling thankful for the cooler air, the clear, bright blue skies, and the feeling that everyone is cozying up with their families filling their bellies with comforting foods and curling up under warm blankets. In our own home, I'm watching Riley make the transformation from baby to toddler to little boy. His sweet snuggles are few and far between because, let's face it, there are more exciting things to do. But the way he says mommy melts my heart to a gooey puddle on the floor. The overriding emotion I have is, appropriately, thankfulness for all of these things and much more. My heart is full. This is the first Thanksgiving in 5 years that I haven't hosted. It's kind of a strange feeling because typically this time of year is filled with menu planning, cleaning, and usually trying to tackle a random house project that probably isn't necessary but seems like a good idea at the time. I think I am a bit of a bite-off-more-than-I-can-chew type of person in that respect. Not hosting thanksgiving has also made it a little harder to get in the holiday spirit. My sister and I have always been the worst offenders when it comes to listening to Christmas music too early. Not so for me this year. One of our neighbors put up their Christmas lights last weekend and I said to Brad, "Can you believe they already have their lights up?" When he reminded me that Thanksgiving was mere days away I went into a little bit of shock and tried to force myself into the holidays by having a peppermint mocha, a Christmas Ale, and listening to a little Christmas music. No, not all at once. 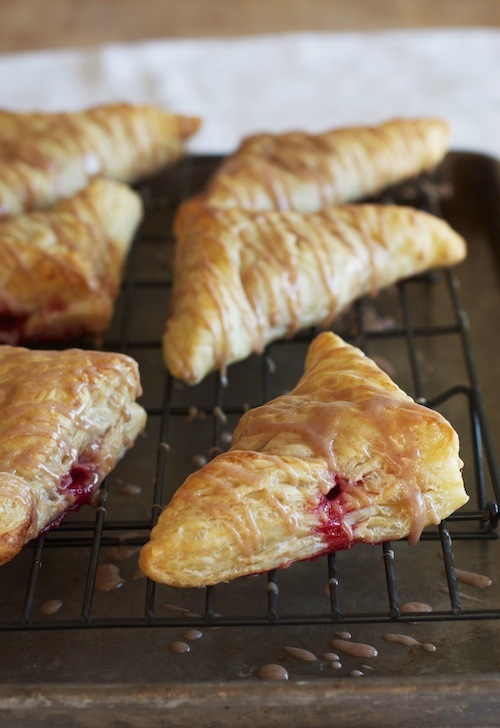 Making these delicious cranberry turnovers with cinnamon glaze may have worked better than any other attempt to prepare for the upcoming holiday season. The bright color of the cranberry filling (which is actually the cranberry sauce from Monday's post here) and the warm cinnamon icing created a lovely dessert full of seasonal flavors. Store-bought puff pastry folded into triangles and baked to a beautiful golden brown makes for an easy and beautiful dessert for Thanksgiving. Or breakfast for whenever. I won't judge. This is a perfect way to bring a little Thanksgiving into your home even if you aren't hosting. So, whip up a batch of cranberry sauce (it only takes about 15 minutes), followed by these turnovers, and ending with a cocktail coming your way on Friday! Who knew cranberry sauce could do so much? I'm thankful for you, cranberries. On a lightly floured surface, unfold the pastry sheets and cut each sheet into 4 squares. Place the squares on a parchment lined baking sheet (use two baking sheets if you need to). Spoon 1 tablespoon of the cranberry sauce in the center of each pastry square. Fold the pastry over the filling to form a triangle. Brush the tops of the triangles with the heavy cream. Use a sharp paring knife to cut 3 slits in the top of each turnover. Bake the turnovers until they are puffy and golden brown, about 10-12 minutes. While the turnovers are baking, combine the ingredients for the glaze in a small bowl and stir until smooth. Set aside. Remove the turnovers from the oven and let cool slightly. Transfer the turnovers to a cooling rack set over a baking sheet. Drizzle with the glaze and allow them to cool for at least 5 more minutes before eating. 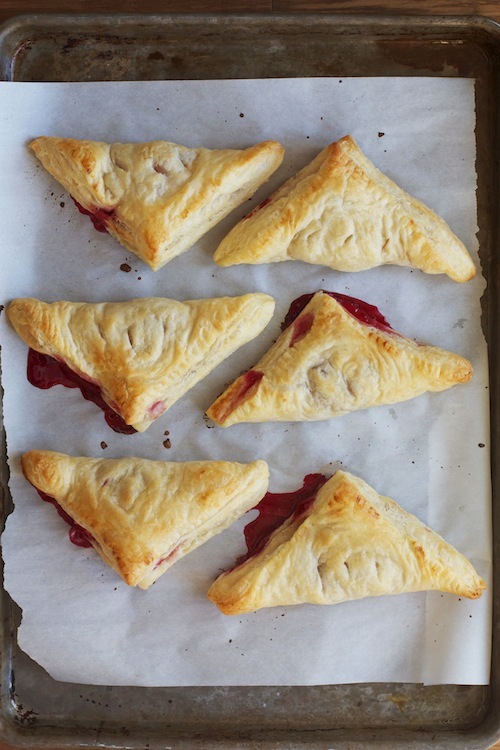 The turnovers can be enjoyed warm or at room temperature. They are best when enjoyed within 2 days.